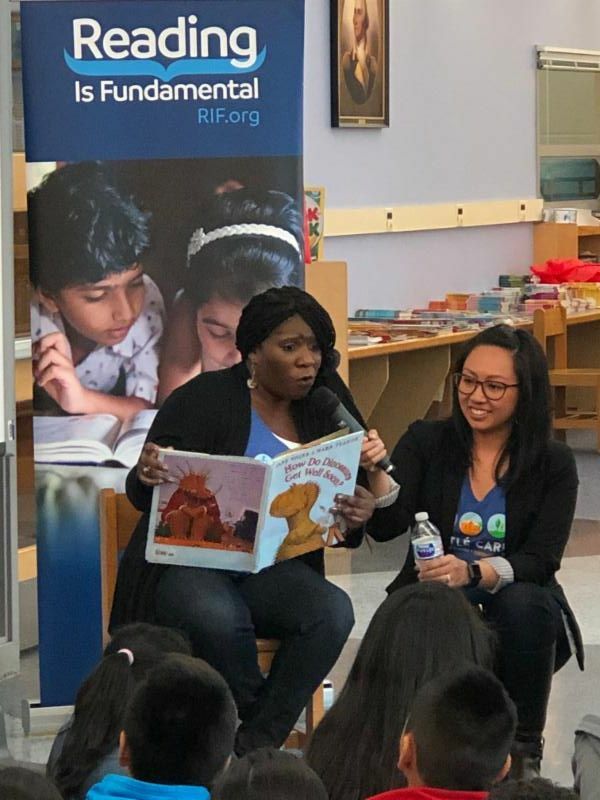 March RIF of NOVA News! Keep reading to children, even when they can read! Learn more! March Forward for New Books! Keep Reading to Children...Even After They Can Read! Parents may think that once their kids learn to read, they no longer need to be read to. Wrong! 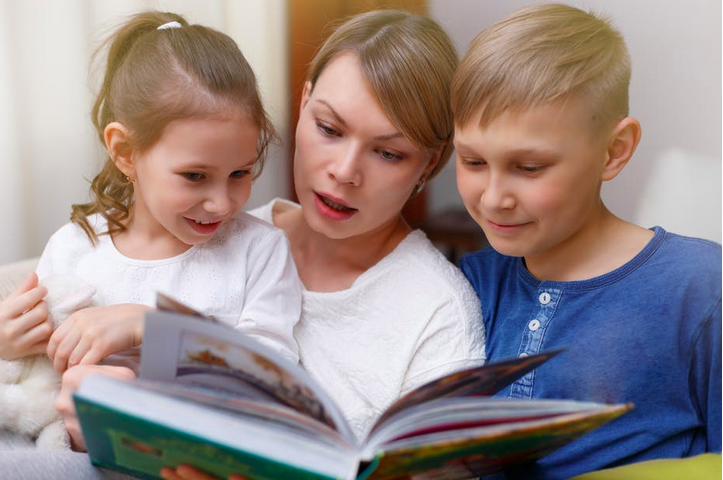 Studies show that reading to your children even when they have learned how to do so is extremely important. 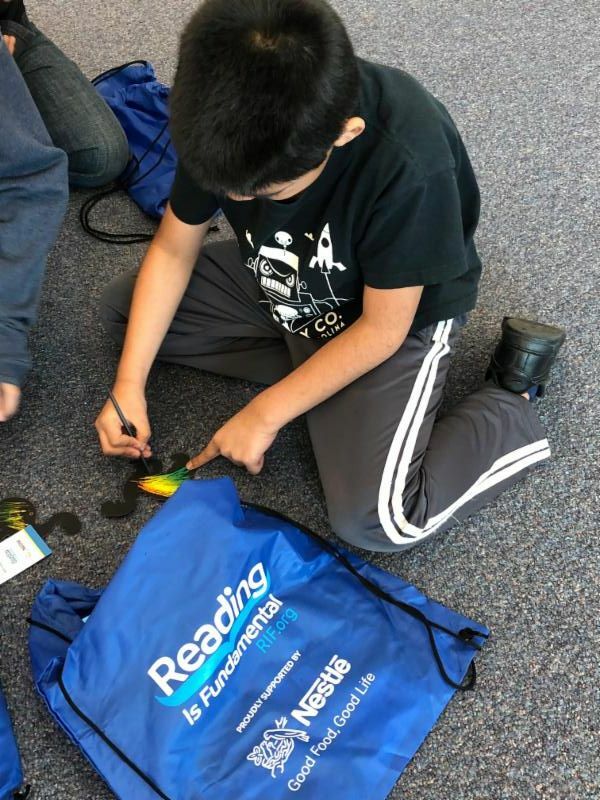 Benefits of shared reading include facilitating enriched language exposure, fostering the development of listening skills, better spelling, reading comprehension, and vocabulary, and establishing essential foundational literacy skills. Reading together is also a shared social opportunity between parents and their children to foster positive attitudes toward reading. Learn more here! 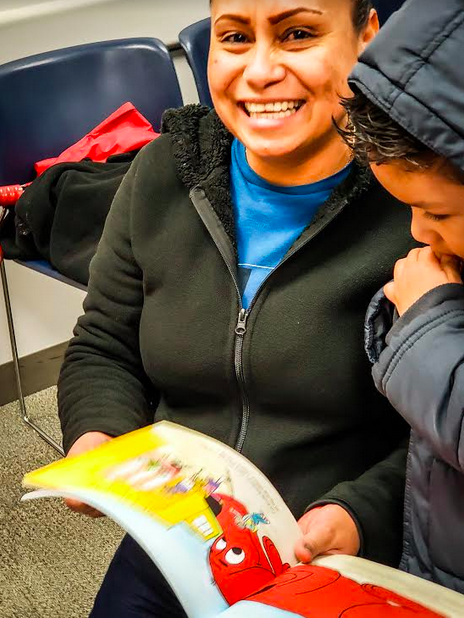 Even Start is a free family literacy program (housed in Barcroft Elementary School) for Arlington residents who have children under the age of 10. Its goal is to empower parents who are new to the country to help their children be academically successful. 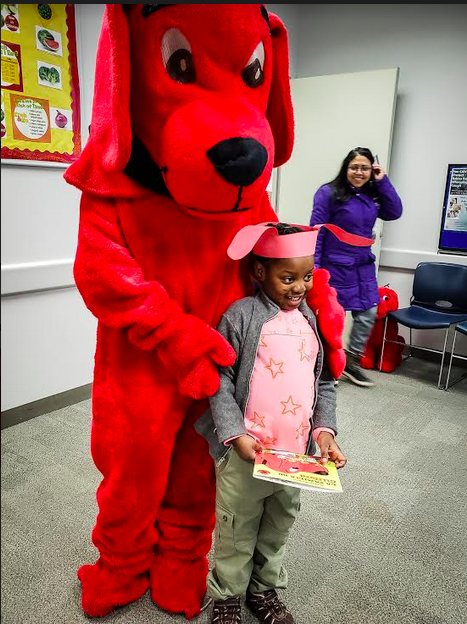 Program director and RIF of NOVA liaison Sara Mulrooney hosted a Valentine celebration to encourage families to read together! RIF of NOVA added to the celebration with a number of new books for families to share. Before the event, parents were encouraged to take photos of their children reading or of family members reading together. 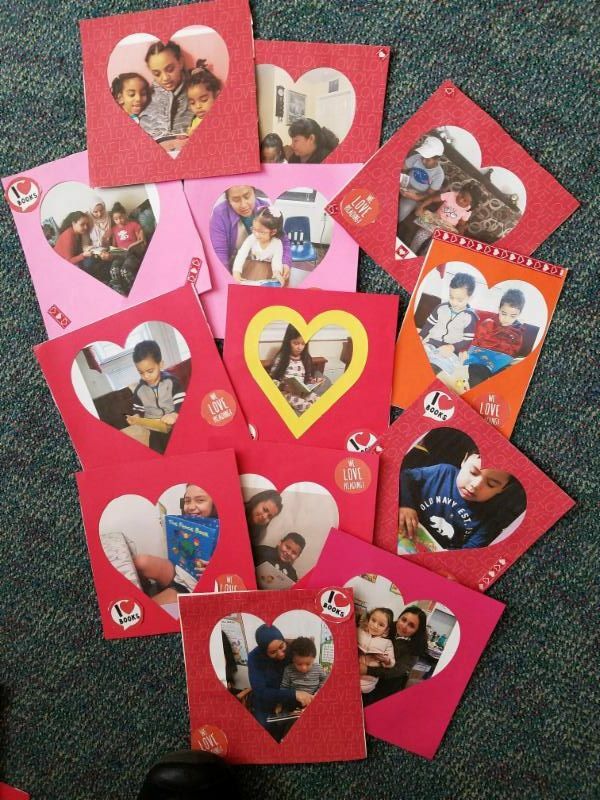 At the event itself, many made Valentine refrigerator frames to take home to continue the love -- of families and books! Clifford Steals the Show at South County! 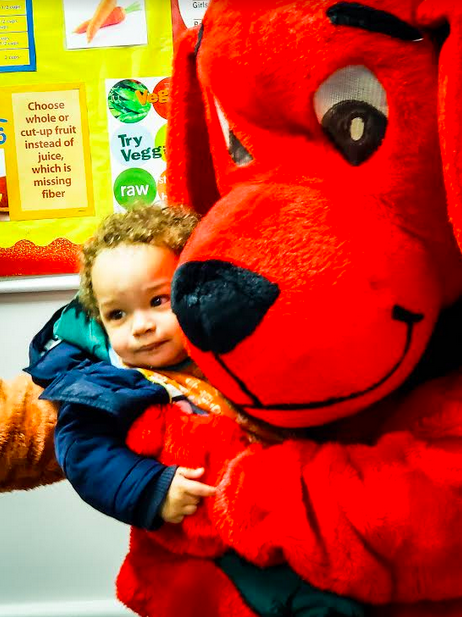 The BIG RED DOG popped in at the South County WIC program's RIF of NOVA party. Staff members took turns in the red fur costume, bringing smiles and lots of hugs. Many children picked out Clifford books, made Clifford hats, and could barely sit still as their faces were painted with a nose and whiskers. Stories, cookies, and coloring sheets helped fill in the time waiting for check ups. It was a happy day for these youngsters as their families learned about healthy food and good reading! 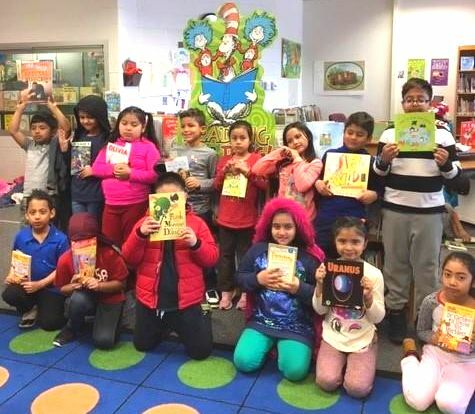 The National Education Association's Read Across America is an annual reading motivation and awareness program that calls for every child in every community to celebrate reading. Program activities take place on or around the March 2 birthday of children's author Theodor Seuss Geisel, better known as Dr. Seuss. 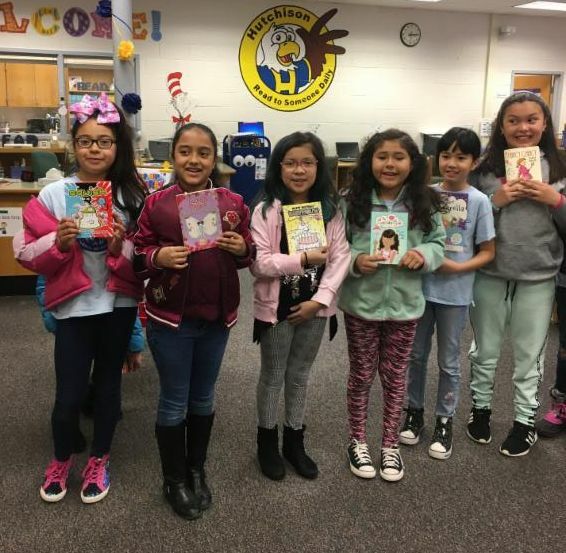 Many RIF of NOVA schools held book distributions to celebrate! RIF of NOVA liaison Marci Hoyt lead a book distribution that highlighted the U.S. states -- specifically focusing on where different authors live or lived or where the story takes place. 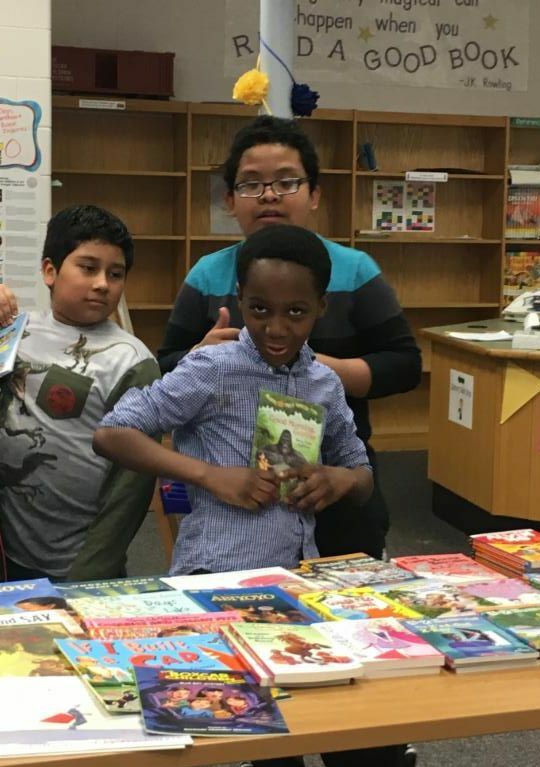 Boys and girls alike loved hamming it up for the paparazzi with their new RIF of NOVA books! Janice Perreault is the librarian and RIF of NOVA liaison at Bailey's Elementary School for the Arts and Sciences. For Read Across America week, she highlighted a different author each day throughout the celebration. RIF of NOVA board member Chris McLaughlin (shown below) read a book by highlighted author Mo Willems. The kids loved the interactive reading of his classic, Don’t Let the Pigeon Drive the Bus. As the pictures show, there was a lot of excitement over all the book choices. 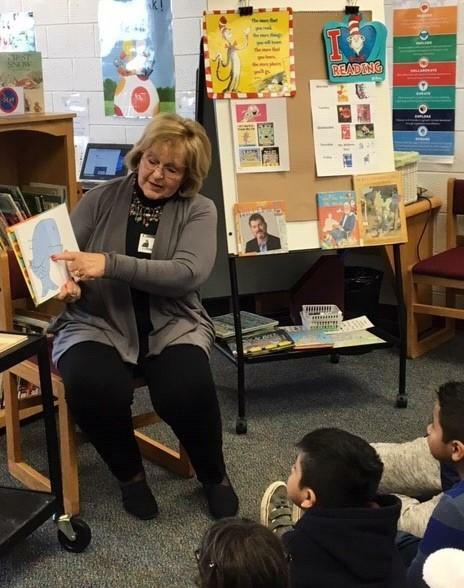 ...librarian and RIF of NOVA liaison Linda Lindgren held a week-long Read Across America celebration, too. 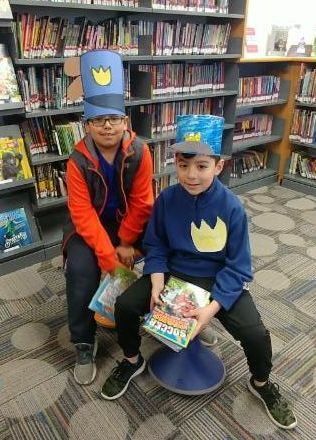 On one of the days, the third- through fifth-grade students were invited to dress as a favorite book character -- as they chose their RIF of NOVA-provided book. Board member Chris McLaughlin noted that the children were fairly boisterous until she read them a book called Maddi's Fridge by Lois Brandt. "The kids got so quiet, you could hear a pin drop," Chris said. "I would recommend this book to all librarians as it’s a poignant tale of friendship between two young girls, and the secret that one is asked to keep for the other. It’s especially engaging as the characters are very relatable to our RIF children." These two Bailey's Upper School students dressed in their favorite character, Dog Man, from the series created by author Dav Pilkey. Pilkey also created the Captain Underpants series. 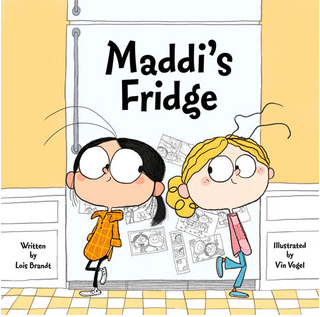 Filled with colorful artwork, Maddi's Fridge addresses issues of poverty with honesty and sensitivity while instilling important lessons in friendship, empathy, trust, and helping others. A call to action section is included, with six effective ways for children to help fight hunger. Nestlé USA Joins the Community in Support of Books! Nestlé USA, a subsidiary of Nestlé S.A., recently moved its U.S. headquarters to Rosslyn, Va. 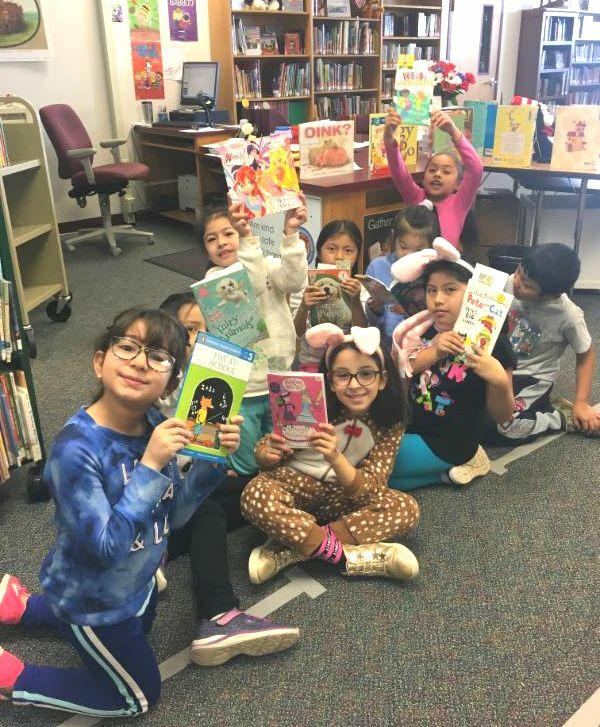 The firm partnered with national RIF to provide books to all of Arlington’s elementary school libraries -- including a health and nutrition book collection for grades four through six. 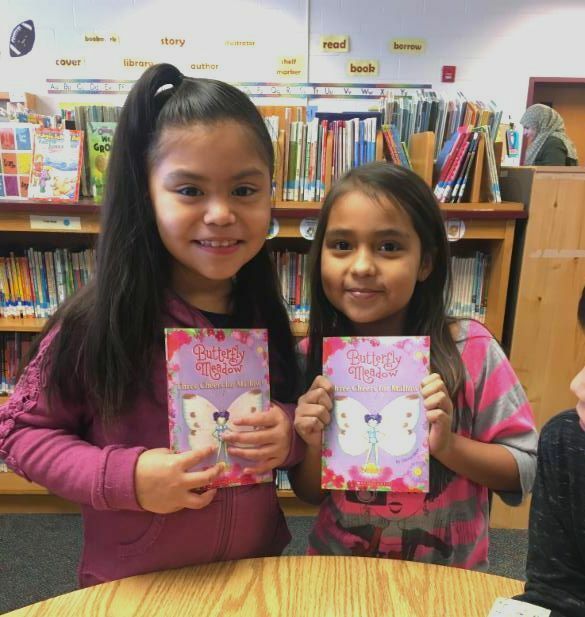 In addition, on March 14 and 15, Nestlé and RIF held two book distributions -- at Carlin Springs Elementary and Oakridge Elementary. The children heard the book How Do Dinosaurs Get Well Soon , colored paper dinosaurs, and then chose three books each to take home in a special tote bag! Welcome to the neighborhood, Nestlé, and thanks national RIF! 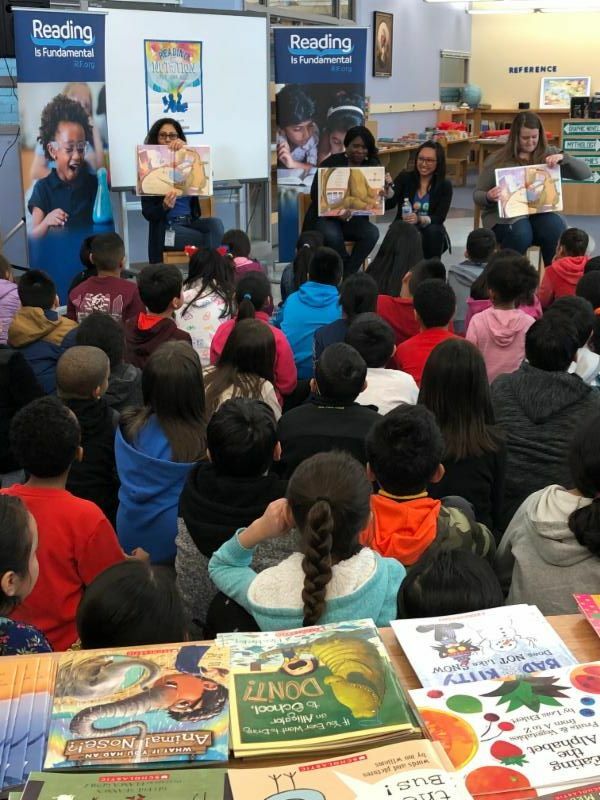 Nestlé's Jennifer Campbell read to Carlin Springs children, with help from colleague Kim Pagal. Carlin Springs third graders were enthralled with the dinosaur book by Jane Yolen and Mark Teague. Coloring a dinosaur was such fun, along with a tote bag, a book mark, and three books to take home! "I walked out into my neighborhood and..."
Attention K-3 children in Northern Virginia, Maryland, or D.C.! Finish the sentence above with an original story, poem, or piece of non-fiction of your own and participate in the annual WETA Kids writers contest. There will be first, second, and third place winners at each grade level. First place winners from each level will have their stories made into a hardcover book. Attention teachers! The local class, after-school, or child care center that submits the most entries to WETA Kids will win children’s books and a visit from a famous PBS character! All entries must be postmarked by April 26, 2019. 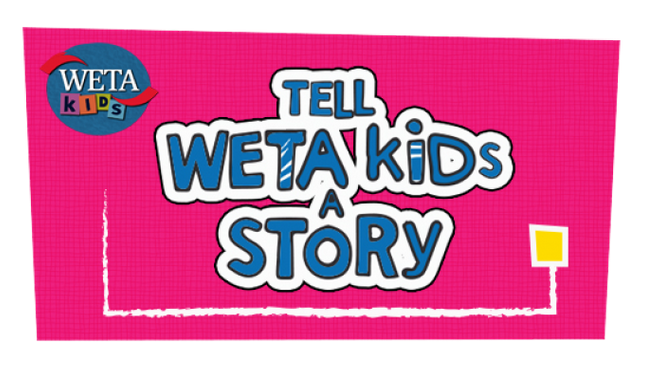 Learn more here: https://weta.org/kids/write. Attention teachers and librarians: Ezra Jack Keats Mini-Grants! The Ezra Jack Keats Foundation, dedicated to supporting arts and literacy programs in public schools and libraries across the country, is encouraging qualifying educators to apply for a 2019 Ezra Jack Keats Mini-Grant. Applications are currently being accepted, and the deadline for submissions is March 31, 2019. Approximately 70 grants, up to $500 each, will be awarded to teachers and librarians whose proposals demonstrate creativity and a desire to make learning fun. Learn more here! As these faces show, children in the RIF of NOVA community are always so grateful for your donations! Here are ways to give books to deserving children. Remember that every $2.00 you give = one book for a child! 1) Send a check to our mailbox: P.O. Box 7012, Arlington, VA 22207-0012. 2) Give at any time via PayPal on the RIF of NOVA website www.rifnova.org. 3) Register with smile.amazon.com. Type in Reading Is Fundamental of Northern Virginia, Inc. to select us as the charity you want to support. Amazon will donate 0.5% of your eligible purchases to RIF of NOVA. Please share the RAP! Forward our newsletter to your friends and anyone interested in providing books to children who need them! Subscribe here !